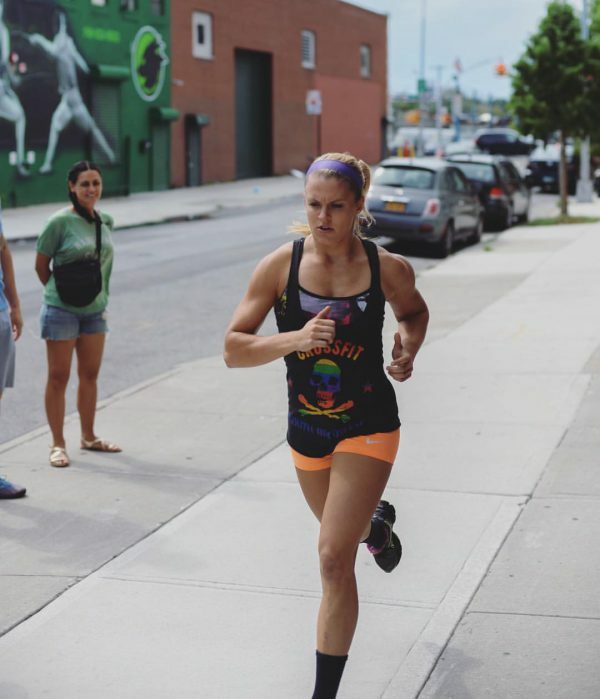 This article is Part 2 (Read Part One) of a series we will be publishing that will consist of us following a CrossFit Games Regional Hopeful, Katie Harper, through her journey and progress over the next year. Her coaching will be handled by Jonathan Kinnick who, for those of you that don’t know, is pretty awesome. Jonathan is a Co-Founder of BTWB as well as the owner of CrossFit Kinnick. He’s a Board Member on the CrossFit Trainer (CCFT) Certification Board and a CrossFit CF-L3 Trainer. He’s also completed the CrossFit Coaches Prep, CrossFit Competitor’s, CrossFit Olympic Lifting, CrossFit Endurance, CrossFit Mobility and CrossFit Nutrition courses. He is also a USAW Sports Performance Coach. 35% of the time it works…every time. This percentage is not just another arbitrary movie quote but more so a means to quantify my perception on the progress I’ve made since the last time I checked in. Over the past 5 weeks, I have logged 24 training sessions, consumed a semi-impressive amount of food, traveled, coached a bit, and worked my regular office hours. As we’ve mentioned before, showing up, putting my head down, and getting my work done is the easy part. It’s the other lifestyle stuff that I struggle with. You know, that meal prepping, routine, rest and relaxation, kind of stuff. I know myself pretty well at this point, and when it comes to habit change, I am not a ‘cold turkey’ kind of person. For me, change is a process. I need time to consider my options and tweak variables, in order to find out which habits stick and which don’t. I would say that since committing to the 2018 training season, I am about 35% closer to where I want to be. I am scheduled to train five times a week, with two programmed rest days. There is a daily WOD assignment from Jon, followed by monostructural cardio pieces 2-3x/week. I have also been supplementing my workouts with Performance Care via coach Keith Van Wickler from the ActiveLife Staff, in order to keep my joints healthy and happy. Even in this short time, I’ve noticed some subtle improvements from the programming that Jon has provided. The movement exposure is well-rounded, the volume has been reasonable, and for the most part, my body feels recovered and ready to perform for each training session. I find it has been a nice balance for my conditioning, as I play around with my ability to push the red line through the daily WOD, while also perfecting my pacing game in the longer monostructural pieces. As for Performance Care, it has been doing wonders for my back, and I was able to successfully pull ~90% of my 1RM deadlift in a workout 10 times, pain free, just yesterday! In a perfect world, I would have a more consistent schedule, as well as a dedicated group of training partners to keep me on track. Alas, it’s summer, and I’ve got a social/work calendar that I’m not always willing to sacrifice. I have spent a total of four out of five weekends away from my apartment. Trust, that I have gotten VERY creative, when it comes to squeezing in my weekly programming. I’ve actually only missed two total training days of the past 5 weeks. But, it is important to consider that breaking away from a routine is a major stress factor, and something I could afford to be better about over the next couple of months. Diet: I don’t want to taco bout it. My current body composition goal is to gain 3-5 lbs of muscle, while staying roughly within the 135 lb range. According to my CompositionID scan 8 weeks back, I was sitting at 136lbs, 17.1% body fat, with only an inkling of hope that I would be able to grow some quadriceps on my little stems by the end of the year. With this goal in mind, Jon gave me daily intake targets, asking that I track my daily calories and macros in an app. How is it going, you ask? Let’s just say, the 80/20 rule quickly turns into 20/80 the second I spy that GNC sign with the shelf full of “protein” desserts. I am a strong believer in the theory that the Lenny and Larry’s complete cookie is the gateway treat for all sweets that are evil. It may or may not be the trigger that sparked my slight addiction to sugar, which started sometime after I first laid eyes on that dang snickerdoodle thingy. Although the running joke is that my macros consist of mostly peanut butter, popcorn, and eggs; I haven’t gone completely off of the deep end. Four out of seven days, I am fueled by Kettlebell Kitchen, I have my breakfast routine down to a science, and I have cut my cookie intake down to 1 per week. Better yet, I have reduced my casual drinking to occasional outings with friends, and some weekends. Surprise, surprise, cutting back on alcohol has led to a huge improvement in my performance at the gym. An added bonus is, I’ve leaned out just in time for muscle tank season, hayyo! I could afford to get an extra hour of sleep, and I need to spend more time in the parasympathetic state. Period. As an athlete and an individual who is always required to be “on” for their career, I find that I rarely spend any time alone, in a quiet room, with no stimuli other than my thoughts. I have been learning to value these rare moments, and actively seek it out, even if it’s only 15 minutes per day. A few things that I’ve tried so far; acupuncture, epsom salt baths, walking on a quiet street without music, and doodling in coffee shops. It’s not something that I’ve been consistent with, but is something I’m working on, and look forward to discussing further in the article series. All in all, while this whole process may sometimes seem a bit overwhelming, it’s important to remember how truly lucky I am. I’m in my late 20s, living in New York City, one of the most energetic places in the country, with essentially endless opportunities at my fingertips. Although at times I do feel that I should be taking advantage of my space and experiencing as much as possible, I also recognize that I’m at the peak of my athletic career. More often than not, I would prefer to hit the weight buffet over brunch, say no to late nights, and generally very happy with that choice. Overall, I think it’s important to have a healthy combination of balancing needs and wants, consistency in the gym, while also trusting the process throughout the journey. When in Rome.